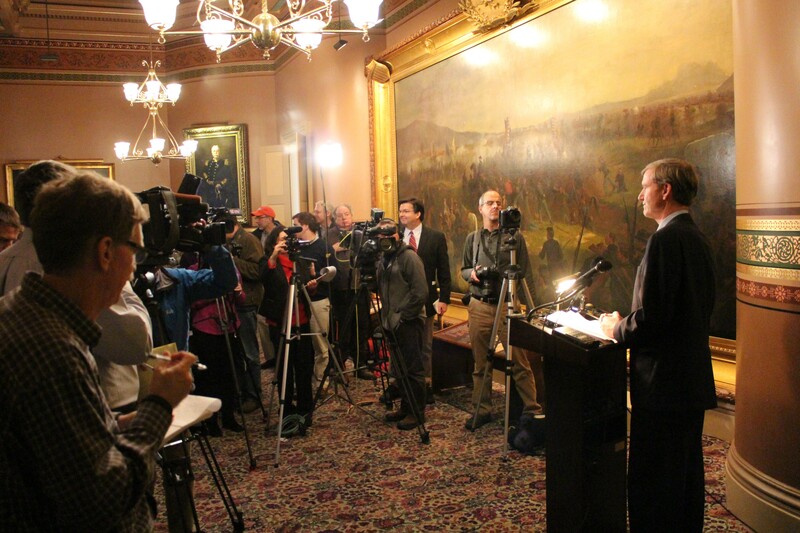 Scott Milne speaks to reporters Monday at the Statehouse. The second-place finisher in last month's gubernatorial election called on the legislature Monday to name him governor in January. Emerging from a month out of the limelight, Republican Scott Milne called his near-victory over Democratic Gov. Peter Shumlin a rebuke of the incumbent's four years in office. He told reporters during a morning press conference at the Statehouse that he would press on in his bid to become governor, despite falling 2,434 votes short. Since no candidate received a majority of the votes cast in last month's election, Vermont's constitution dictates that the legislature choose a governor from among the top three contenders. Shumlin won 46.4 percent, Milne 45.1 percent and Libertarian Dan Feliciano 4.4 percent. "If I were one of them,” he continued, “I would very seriously consider a vote for Scott Milne." Though Milne has previously floated the notion that legislators should support the candidate who won a plurality in their district, he did not make that argument Monday. Instead, he characterized next month’s vote as one of “conscience.” He said legislators should also take into consideration Shumlin’s performance as governor. Milne said he had considered waging a “political campaign” in the legislature, hiring a lobbyist to make his case and busing supporters to the Statehouse to demonstrate enthusiasm for his bid, but he opted against those approaches. As such, he said, he will not spend the next month lobbying lawmakers to support his candidacy. "I am not proactively going to be trying to convince legislators to vote for me," he said, adding that his "door is open" to those who hope to discuss the election with him. "But I don't think ... it should be something I should be twisting arms for." “I ask only fair consideration in the vote for governor,” he said. Throughout Vermont’s history, the legislature has chosen the top vote-getter in 20 of the 23 times in which no gubernatorial candidate has won a majority. But Milne disputed the notion that the second-place finisher ought to concede. Milne said he would be ready to govern if elected and would accept help from those interested in joining his hypothetical administration. In a written statement provided to reporters after the press conference, Shumlin said he was confident the legislature would elect him governor and that he was focused on "the challenges facing our state." "I am honored to have received the most votes in this election and would not want to serve as governor if I did not," Shumlin said. "I continue to believe that the legislature will honor the long democratic tradition of electing the candidate who received the most votes."